Our Bluetooth Speaker Water Bottle makes for a fun and convenient item to bring with you on a hike or day at the beach. It offers a clip-on ring for easy carrying, comes in a black giftbox, and contains a bluetooth speaker that has a rechargeable battery that lasts up to 3 hours. 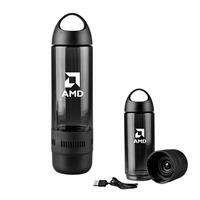 BPA Free and Hand Wash Recommended (remove speaker portion when washing). Wine down with Wowline! 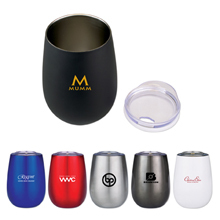 Our high-quality wine tumbler provides a great option for taking your wine with you! Available in Black, Red, Grey, White, Blue and Silver. Double wall vacuum insulated and copper lining to keep drinks hot up to 8 hours and cold up to 12 hours. Clear lid included. Cup holds 10 oz. Hand wash recommended. Must order in increments of 25. 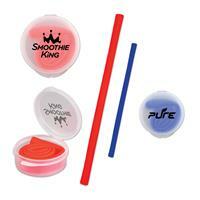 Keep a straw on you at all times with this reuseable silicone straw! Easily bendable and dishwasher-friendly, these straws make for a great giveaway while showing your business's green side. Available in two colors: Blue (S21254X) and Red (S21255X). One location imprint only. 16 oz Single Wall Pint. Rolled rim and unbreakable stainless steel makes this a great event item! The Brew2Go(TM) travel cup is great for a fun campaign! Perfect for the beach, pool, golf course or outdoor concerts, this double-wall insulated tumbler with a lid measures 3 3/4" diameter x 8" h and reaches its 18 oz. capacity when filled to the rim. 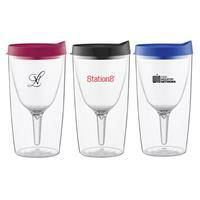 This cup gets your brand seen everywhere recipients go. Have your logo or message imprinted to take advantage of the exposure today! Handwash recommeded. One color imprint only. The Vino2Go(TM) travel cup allows you to take your wine on the go! Perfect for the beach, pool, golf course or outdoor concerts. 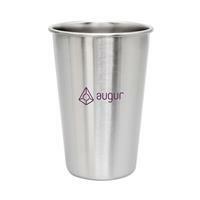 This double-wall insulated tumbler with a lid measures 3 1/4" diameter x 7" tall and reaches it's 10 oz. capacity when filled to the rim. This BPA free favor gets your brand seen everywhere recipients go. Have your logo or message imprinted to take advantage of the exposure today! Handwash recommended. One color imprint only. 20 oz. 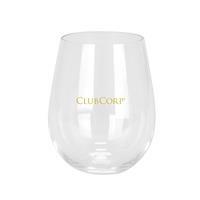 Tritan Stemless Wine Tumbler. Looks like glass but has the flexibility of Tritan. Tritan is a BPA-free plastic- it is not manufactured with bisphenol A (BPA) or other bisphenol compounds, such as bisphenol S (BPS). Tritan is impact-resistant products can be used without fear of shattering. Hand wash recommended. Our red cup shot glass features 7mm beads on a 33" strand necklace. Ideal for any party, or event! 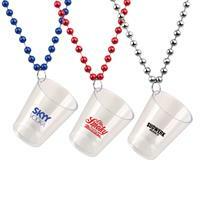 Add your custom imprint to the shot glass and give them out at tradeshows, fundraisers or conventions. A great way to promote a pub or bar! We apologize but due to state regulations we are unable to ship bead products to California. Time to celebrate! Our shot glass bead necklace measures 2oz, with 7mm, 33" beads. They are ideal for any themed parade. 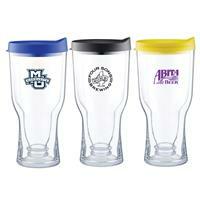 Add your custom imprint to the shot glass and give them out at tradeshows, fundraisers or conventions. A great way to promote a pub or bar! Available in silver (S55004X), blue (S55003X), and red (S55002X). We apologize but due to state regulations we are unable to ship bead products to California. 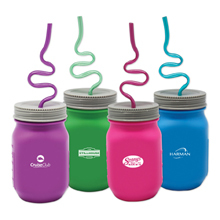 Our Krazy Straw Mason Jars come in assorted colors & are made of BPA free plastic. Cup holds 16oz. Great for your next event or promotion! Handwash only. Krazy Straw® is a registered trademark of Fun-Time International Inc. Once side imprint only. Stock design on reverse side. Our Krazy Straw soda fountain cups come in Red, and Orange & are made of BPA free plastic. Cup holds 16oz. Great for your next event or promotion! Handwash only. Krazy Straw® is a registered trademark of Fun-Time International Inc. One side imprint only. Available in red, orange, blue, green, yellow, pink, purple and neon assorted. Our Krazy Straw sports bottles come in assorted colors, Yellow, Blue, Red, Green, Pink, Purple & are made of BPA free plastic. Cup holds 12oz. Great for your next event or promotion! Handwash only. Krazy Straw® is a registered trademark of Fun-Time International Inc. Krazy Staw stock design on one side of cup. One location imprint only.